Jules Emile Frederic Massenet, composer, was born on May 12, 1842 in Montaud, St. Etienne and died on August 13, 1912 in Paris, France. Like his contemporary Faure, Massenet overlaps the Romantic and 20th Century periods. 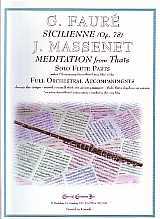 Massenet, who taught composition at the Paris Conservatory from 1878 until his death, is known primarily as an Opera composer (he wrote 36 - the opera Thais was written in 1894); this is an arrangement of the Violin Solo of Meditation.